Farm to Market Road 235 (FM 235) is a farm-to-market road in east-northeastern Cherokee County, Texas. The road runs about 10.58 miles (17.03 km) from an intersection with State Highway 110 (SH 110) in New Summerfield east past a multiplex intersection, then southward to an intersection with SH 204 near Reklaw. This is the second highway to be designated as FM 235. The first designation was created in 1945 for a highway in Jackson County. It was deleted in 1948 in a mileage swap creating FM 822. The current designation was created in 1951, and it was extended to SH 204 later that year. FM 235 begins at an intersection with SH 110 in New Summerfield. It then intersects FM 2274, with which it is concurrent for 0.3 miles (0.48 km). The highway then intersects FM 2420 before terminating at SH 204 near Reklaw. FM 235 has no local street names. Mostly rural for all of its length, FM 235 passes by a landscape of rolling hills of trees and farmland. All of FM 235 has 2 lanes and no shoulders. The first version of FM 235 was commissioned by Minute Order on June 12, 1945. The highway was located north of Edna in Jackson County, and it went from SH 111 east 1 mile (1.6 km) and west 2 miles (3.2 km). This use of FM 235 was canceled on June 1, 1948, as mileage was used for the newly created FM 822. The current iteration of FM 235 was commissioned on May 23, 1951. The initial description spanned 4.7 miles (7.6 km) from SH 110 eastward. The route was extended on November 20, 1951, adding 6.3 miles (10.1 km) more to the designation and extending its eastern terminus to SH 204. ^ a b Transportation Planning and Programming Division (n.d.). "Farm to Market Road No. 235". Highway Designation Files. Texas Department of Transportation. Retrieved May 30, 2018. ^ Google (May 30, 2018). "Map of Farm to Market Road 235" (Map). Google Maps. Google. Retrieved May 30, 2018. ^ Transportation Planning and Programming Division (1996) . Cherokee County, Texas (Map). 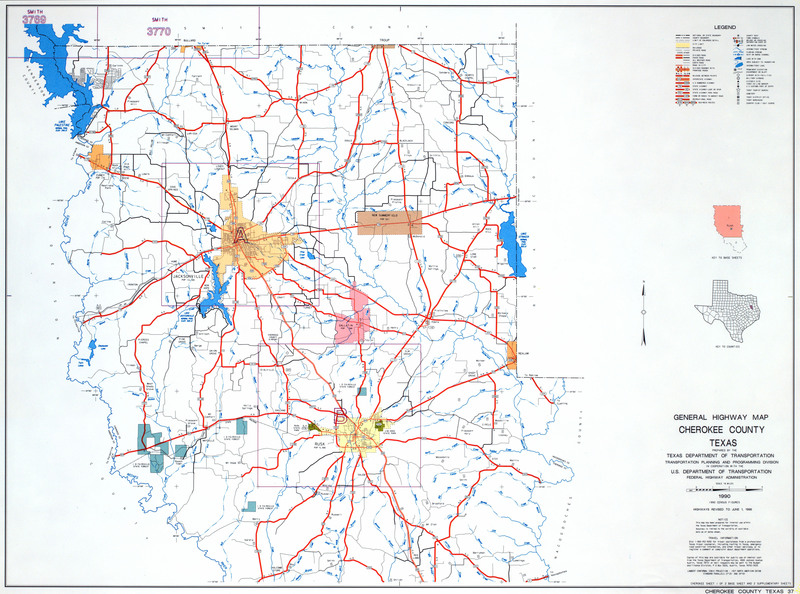 Texas County Maps collection. Texas Department of Transportation. p. 1. Retrieved August 8, 2010 – via University of Texas at Austin. This page was last edited on 8 April 2019, at 04:15 (UTC).